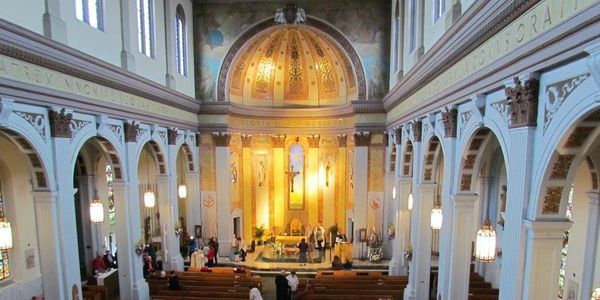 Join Mount Carmel Parishioners in their quest to save the parish and rebuild or restore our beautiful Italian American Church. The church needs serious repair from damages believed to be derived by a STATE imposed highway that was built TOO CLOSE to the Church building many years ago. -Reparing the current Church building. We request that while this work is being accomplished that our Pastor will hold future masses at the recreation center until a new church is build or the current restored for public safety. The Monsignor said, in a meeting with the Mount Carmel Preservation Society, that he will reopen the Church if we raise $ 220,000 needed to make it safe. Pending also engineers deem it safe both inside and out. So far we have over $82,000 in pledges so we a have way to go. We have good news about Our Lady of Mount Carmel! The Historical Commission has delayed demolition for a year, the diocese is doing the construction work to make the church safe to use, and we've established the non-profit Mount Carmel Preservation Society. We hope the church can be re-opened soon. Making great Progress thanks for your support. The Monsignor has promised to open the church if we raise $220,000 needed to make it safe. 1st Victory ! Parishioners and supporters stood tall last night on JUNE 6, 2016 the Historical Commission denied the Demolition Delay waiver requested by the Worcester Diocese. Thanks for your signatures, comments and support. The Prayer vigil yesterday morning was a beautiful opportunity to maintain our parish family.